I guess it is time that I admit that I am not the typical tourist. I would guess that the average tourist who heads off for a week in a tropical location looks forward to sitting in the sun, soaking up the rays, seeing the sites, walking the sandy beaches, swimming in the ocean, and marveling at the bright tropical colours. On a trip to Mexico many would look forward to the beach and snorkeling to see the tropical fish, while others may have plans to see all the archaeological sites of the Mayan and Aztec cultures. The last thing one would want is to have their plans spoiled by rain. I take lots of sunscreen to avoid burning, seek shady spots to sit, don’t really like getting sandy, don’t mind a rainy day or two and plan to get lots of reading done. Don’t get me wrong, I do love visiting Mexico with all its colours; whether natural, in the art and embroidery, culture, or in the music, but I am different from most of the people whom I see there. 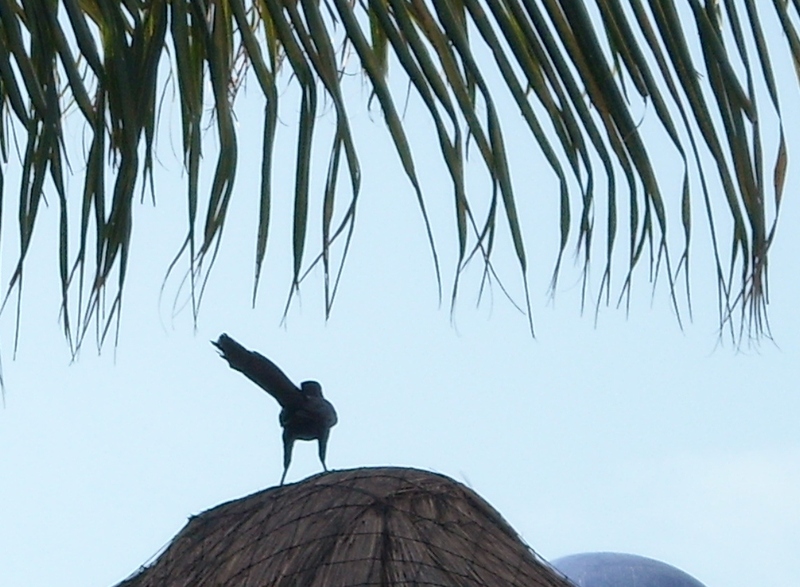 A while back I wrote a post about showing our true colours (http://wp.me/p1hsO8-64) for which the basis was a story about my trip to Cancun a couple of years ago and the fact that the birds I was most interested in were the great-tailed grackles and not any of the fancy tropical birds. I was so intrigued by them, in fact, that I neglected to take a single picture of them. Having just spent a week in Cancun again, I did much better. 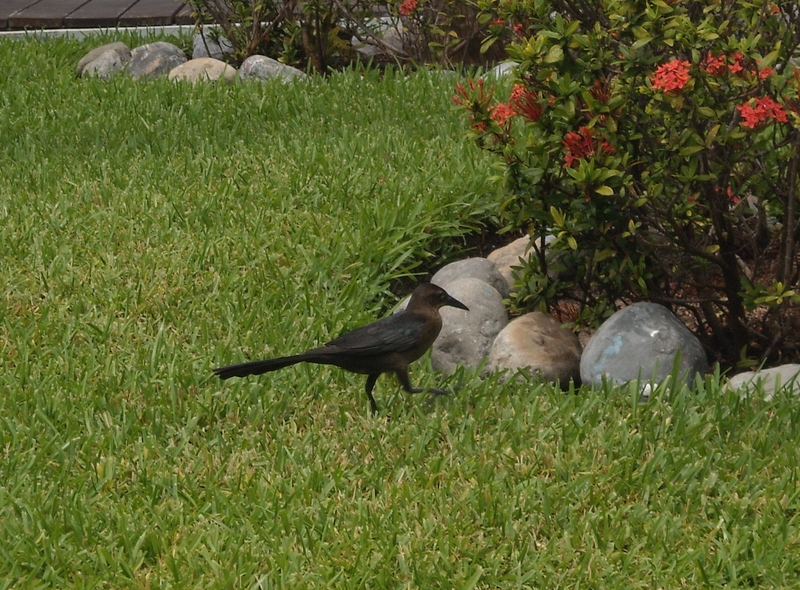 The most interesting bird to me, by far, was still the grackle and I even managed to get a number of pictures. Sure, we saw flamingos, frigate birds, macaws, parrots of various species, a jaguar, a panther, etc. but those birds who are so numerous that I imagine most local people don’t even notice them anymore, remain my favourites. This picture of one of the females at our resort is just one of many that I took of the arguably less attractive female of the species. I enjoyed watching them chase each other away from the restaurant area where they were watching for leftover bits of food from people’s plates. They would sit on the railing or in nearby trees waiting for a waiter to clear a table and then they would swoop down on the tray of dishes to see what morsels were left for them. There was one in particular who did not like having competition for the food, nor for the cute males who were busy trying to get their attention. 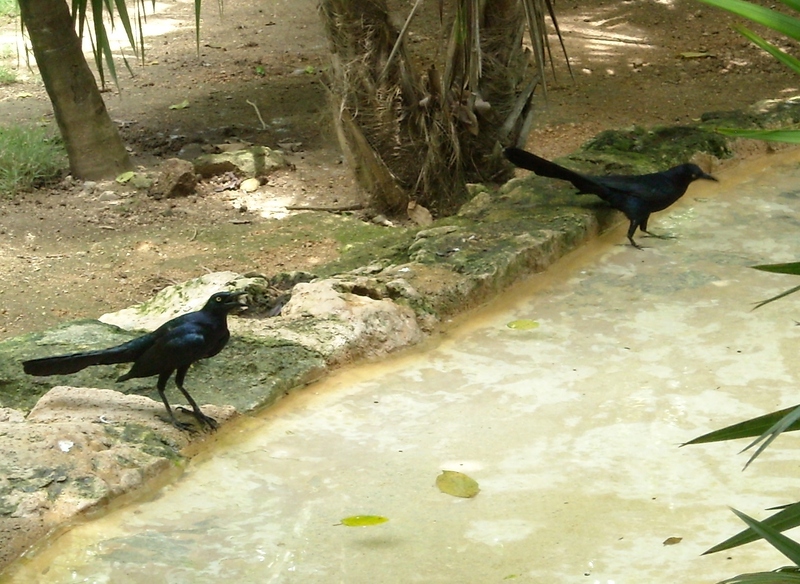 These two gentlemen are headed into this pool for a drink and likely a bath in the pool of the nursery section of Xcaret where the focus is on raising birds of many of the species on the threatened and endangered list like some of the species of parrots, vultures etc. Clearly these simple black birds are far from endangered, but are happy to avail themselves of the amenities regardless. Plain as these birds are, if you watch their behaviour you can see their personalities and individuality showing just as plainly as the more colourful birds. 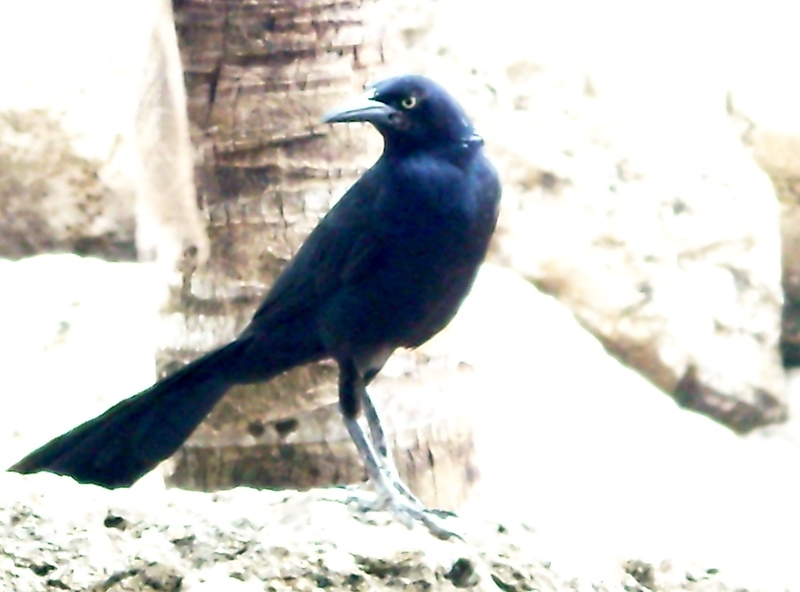 Maybe I identify more with the grackle than with the macaws and parrots. After all, I don’t really have bright plumage, I don’t make for great postcard type pictures. Like the grackles and rainstorms, I will not turn up depicted in art work or souveniers to sell to people to remind them of their visit to a brighter world. I do, however, have a voice that gets people’s attention and hopefully a “song” or two which will brighten their days. So here’s to the common birds, the everyday people and to the rainy days!